1) This paper was presented at the FIG Working Week in Sofia, Bulgaria, 17-21 May 2015. Implementation of marine cadastre in Israel started in 2011. 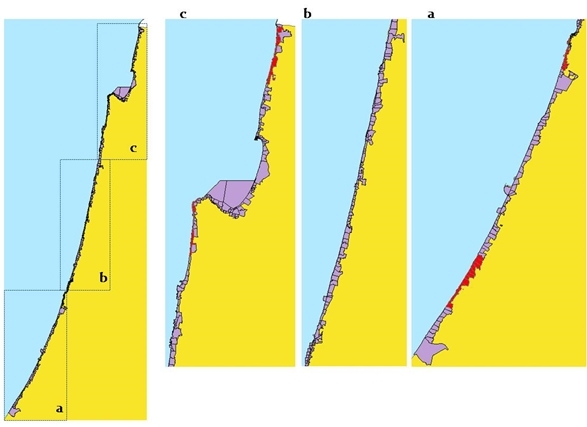 This paper elaborates on the implementation and plans regarding a marine cadastre that will achieve a cadastral coverage over the sovereign area of Israel, including a description of its implementation in the approved marine settlement blocks as a result of cooperation between Survey of Israel (SOI) and the Department of Registration and Land Settlement (The Land Registry) under the Ministry of Justice. 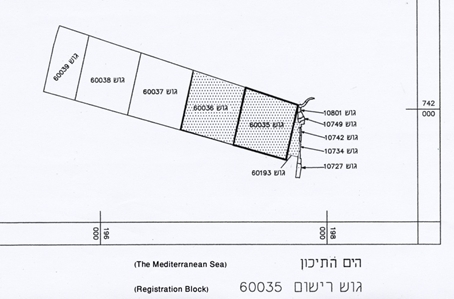 The first three marine settlement block plans, designated as marine cadastre in Israel, were approved and signed as registered blocks in October 2011. This was the first milestone of implementing a marine cadastre in Israel following and concluding preparatory work for a few years. Since then, an additional 13 marine blocks have been fully registered and 13 are in an advanced stage before their final approval. This reflects a fast growing interest and various activities regarding the coastal and marine environment in Israel. Israel is a coastal state. The marine areas of Israel in the Mediterranean Sea include the territorial sea (TS) where it has full sovereignty and the exclusive economic zone (EEZ) where it has partial sovereign rights. In recent years the Survey of Israel (SOI) launched a few relevant initiatives, including the following: coordinate based cadastre (CBC) projects, one of which included transformation of 60 land registration blocks to CBC along the coast line, 3D cadastre, and land-marine Spatial Data Infrastructure. SOI published a series of hydrographic charts and two atlases showing the formal coast lines to support the Law of Protection of the Coastal Environment. The rapidly developing activities regarding the search for gas and oil in the above-mentioned Israeli marine areas, and the important gas explorations, including the activities of developing a marine infrastructure for the conduction and distribution of the exploited gas, under the responsibility of the Ministry of Energy and Water, play an important role in the development of the marine area. In addition, other ministries advanced development plans in the marine area, including the Ministry of Agriculture, the Ministry of Interior, the Ministry of Transportation, among others. These requirements were considered before launching the marine cadastre initiative. The final settlement of a marine cadastre depends on the final delimitation of maritime boundaries between Israel and its neighbors. As long as these boundaries are not concluded and agreed upon, the block plans may cover the marine area except for the marginal blocks that border the international maritime boundaries. 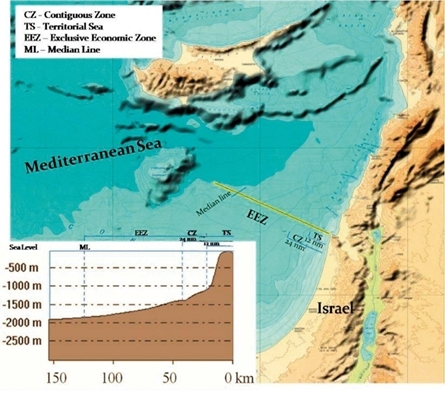 In December 2010 Israel and Cyprus agreed on the delimitation of their maritime boundary in the EEZ. 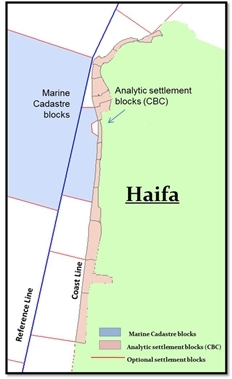 This article elaborates on the above-mentioned situation and plans regarding a marine cadastre that will achieve a cadastral coverage over the sovereign area of Israel, including a description of its implementation in the approved marine settlement blocks as a result of cooperation between SOI and the Department of Registration and Land Settlement (The Land Registry) under the Ministry of Justice. Israel is a maritime state that connects between the Mediterranean Sea and the Red Sea. In addition, Israel shares the Dead Sea and contains the Kinneret (Sea of Galilee) as an internal lake. The traditional cadastre, since the beginning of the cadastral surveys by the British authorities in the 1920s, referred only to a land cadastre. This trend continued after the independence of the State of Israel in 1948. Today, the land settlement covers 96% of the land area of Israel. Most of the unsettled land areas are situated in the northern part of the Negev (the South of Israel). The current rate of growth of the population of Israel is very fast, probably the fastest in the western world. This is reflected by fast urbanization, reducing the open and green areas, as well as by utilization of the space above and beneath the ground. This trend is an important reason for the initiative of implementing a spatial cadastre (3D cadastre) in Israel (Shoshany et al., 2004). Following a significant upgrade of technology at the Land Registry, SOI and the Land Registry will hopefully push the 3D cadastre forward. Another phenomenon characterizing the rapid population growth and the fast urbanization is the exploitation of the coastal areas. One of the measures taken to protect the coastal area is the Law of Protection of the Coastal Environment, the reference coast line for which in the Mediterranean Sea was defined by the Director General (DG) of SOI (Srebro, 2008) and afterwards in the Red Sea and the Kinneret in 2011. In addition, there are rapid developments and activities in the sea itself including the enlargement of ports, the construction of new marinas, power stations, cables for communication, the licensing of gas and oil drillings, etc. In addition, there is a growing trend to construct part of the infrastructure along the coast and in the sea, including a network of gas pipes. This construction, under the responsibility of the Ministry of Energy and Water, is augmented by the exploration of new large gas fields in the sea opposite the Israeli coastline. The Ministry of Agriculture promotes marine agriculture in Israeli waters. Long-range planning takes into account the potential construction of artificial islands, as well as an airport and roads in the Mediterranean Sea opposite the coast. A few years ago, following an initiative involving the transition to a Coordinate Based Cadastre (Srebro, 2010), which included a pilot project of block plans along the coast line, the DG of SOI decided to begin activities towards establishing a marine cadastre as a continuation of the land cadastre seawards. The definition of the term marine cadastre has two interpretations that follow different scopes and concepts (Binns et al., 2003). One reference to marine cadastre is similar to the land cadastre, referring to boundaries: A marine cadastre is a system that enables the boundaries of maritime rights and interests to be recorded, spatially managed, and physically defined in relationship to the boundaries of other neighboring or underlying rights and interests (Robertson et al., 1999). The other definition covers a wider scope: A marine information system, encompassing both the nature and spatial extent of the interests and property rights, with respect to ownership, various rights and responsibilities in the marine jurisdiction (Nichols et al., 2000). Furthermore, the concept of marine cadastre is developed later on to the scope of the Multipurpose Marine Cadastre in the USA by NOAA Coastal Services Center and the Mineral Management Service (MMS), as shown in their homepage (www.csc.noaa.gov/mmc) and by the FGDC Marine Boundary Working Group. The US Maritime Cadastre is an information system that supplies web services, based on authoritative data sources, integrating legal, physical, ecological, and cultural data and information in a common GIS, as well as rights, restrictions, and responsibilities (Fulmer, 2007). The Canadian approach also refers to the multipurpose nature of the marine cadastre and supports it by a marine geospatial data infrastructure as part of the Canadian Geospatial Data Infrastructure (Sutherland, 2003). This trend was also adopted by the International Hydrographic Organization, which decided in 2007 to establish a Marine Spatial Data Infrastructure Working Group (MSDIWG) and prepared in 2009 a guidance publication for Hydrographic Offices (IHO Publication C-17 – Edition 1.1.0 February 2011) regarding the marine dimension of National Spatial Data Infrastructure (NSDI). The Israeli approach until now, as practiced in the Sea of Galilee, the Dead Sea, the Red Sea, and the Mediterranean Sea is to adopt the limited scope of a marine cadastre, referring to the boundaries of property rights and the rights of use to be registered. Thus, the marine cadastre in Israel is actually a natural continuation of the land cadastre; it follows the same principles and methods of implementation. In parallel, SOI launched an initiative to build a marine GIS and the DG of the Survey, who chairs the Inter Ministerial Committee for GIS, declared in November 2011 the establishment of a sub-committee for marine SDI. In addition, an agreement on the delimitation of the EEZ was signed between Israel and Cyprus in December 2010. Internal waters of a State include waters between the actual coastline and straight baselines along the coasts. A State has full sovereignty in internal waters and its rights over internal waters are identical to its rights over the land area. In cases where internal waters from the baselines landwards are established there is a right of innocent passage (The Convention, Article 8). The breadth of the territorial sea (TS) of a State covers the area between the baselines along the coasts and a limit line not exceeding 12 nautical miles (NM) is measured from the baselines (The Convention, Article 3) (see figures 1 and 2). A State has full sovereignty over its territorial sea including the air space over the territorial sea and the subsoil (The Convention, Article 2). Vessels of other States have rights to innocent passage in the territorial sea of a State (The Convention, Article 17). The contiguous zone is up to 24 NM (12 NM beyond the TS) from the baselines (The Convention, Article 33). The rights of the State in this area do not refer to sovereignty but instead to the prevention and punishment of infringement of customs, fiscal, immigration or sanitary laws and regulations within its territory or territorial sea. 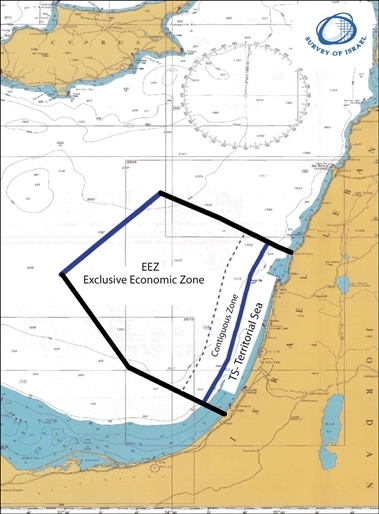 The exclusive economic zone (EEZ) of a State is up to 200 NM from the coastal baselines (The Convention, Article 57), beyond which are the high seas. The rights of a State in this area refer to living resources like fishing. In addition, there are specific rights for mineral resources and to exploitation of the seabed and sub-surface, which refer to the continental shelf (CS) which may exceed the EEZ under specific conditions in the open sea. There are rights of freedom of navigation as well as flight rights over the EEZ. A State has only limited sovereignty rights over the EEZ to use specific resources (The Convention, Article 56). Other zones, which are specified in The Convention beyond 200 NM, for example, with reference to the Legal Continental Shelf and other areas (see also Nichols, 2003), are not relevant to Israel because in the case of the State of Israel the EEZ is less than 200 NM. Thus, the State of Israel has both rights to living resources (referring to the EEZ) and rights to non-living resources (referring to the continental shelf) in its EEZ. Various types of rights are dealt with regarding the maritime zones including navigation rights, customary rights, public access rights, fishing rights, riparian rights, development rights, mineral resources rights and seabed use rights (Sutherland, 2009). The application of The Convention in Israeli waters: Israel is not a party to The Convention, but views the majority of its provisions as customary law. The first question that we have to refer to is: Why do we need a marine cadastre? The answer is the same as for the land cadastre. It is required in order to settle ownership rights and rights of use. The Israeli cadastre does not stop at the coast line. The more the marine space is utilized, the more the settlement of these rights is and will be required. Since the rights are attached to a specific space, an accurate definition of this space is important. Owing to the lack of geographic features on the surface of the sea, the proper way to define it is to define the geographic spaces by coordinates. The recommended method of delimitation and registration of rights is by implementing a coordinate-based marine cadastre. This is also a preliminary answer to the question, how can a marine cadastre be implemented. The marine cadastre should support the State and the regionally driven marine spatial planning initiatives regarding fishery, transportation, recreation, energy production from wind and wave use, marine agriculture, communication cables, oil and gas permits and drillings, installations and pipelines, protection of marine ecosystems, etc., encompassing both property rights and rights of use. Marine boundaries are not demarcated but delimited by coordinates. Such delimitation should prevent confusion, disagreement and conflicts. In envisaging future development and requirements, 3D registration is required to enable the management of rights on the sea surface, in the water space, and in the subsoil space. This should also cover archeological sites in the marine space. The second question that we must refer to regarding the application of a marine cadastre is: to which area should the marine cadastre apply? A few government agencies are responsible for answering this question. The ownership of State lands in Israel is under the Israeli Land Authority. The registration of lands is under the responsibility of the Land Registry in the Ministry of Justice and the responsibility for the delimitation of lands for registration, as well as the delimitation of the international borders of Israel, lies with SOI. The Ministry of Foreign Affairs has its relevant responsibility for the international borders of the State. Thus, the final decision regarding the registration in the sea will be a result of cooperation and consultation between a few Government offices. The decision of the DG of SOI regarding this question was to begin technical preparations for a marine cadastre as preliminary work for the final marine cadastre. According to his view, in coordination with the view of the Director of the Land Registry, the first priority should refer to the areas that are under full sovereignty of the State. This should be the area over which a marine cadastre would be applied first. This decision is based on the relevance of the cadastre to ownership and development rights. Ownership rights in a State are covered by its rules which are applicable to its sovereign areas. These areas refer to the land area, the internal waters and the territorial sea of the State. In the future, the question of applying a marine cadastre in the Israeli EEZ should be dealt with, since there are limited sovereign rights in this area. In practice, the current main task in the EEZ is to delimit concession areas and to manage and control permits and rights to drill and exploit minerals. Following the experience of the USA, Canada and Australia, the Israeli Marine Cadastre should definitely be applied to the Israeli EEZ in the Mediterranean Sea, though it refers to limited rights. This approach requires preparing an Israeli marine spatial data infrastructure that should cover marine areas to the full extent of the Israeli EEZ. Following this approach it is only a matter of priority to apply the marine cadastre at first only to the Israeli territorial sea area. However, the legal method of registration of land settlement blocks is followed, since Israeli law in general is currently not applicable to the EEZ, and the current possibility to register marine settlement block plans refers only to the territorial sea area. Taking into account the multilayered marine space on the sea surface, above it, and below it, the answer to the question "where", should include the three-dimensional space down to the depth of the subsoil. The third question is: When should a marine cadastre be implemented? The answer is: as soon as possible. This is justified by the low cost and the high speed of the "land" settlement process when an area is owned by the State and is still mostly free of rights of use, and is characterized by low density of man-made features. The planned activities and the continuous process of development and exploitation of land along the coast, which is also reflected in the fast growing value of lands along the coast, indicate that in the future the creation of a marine cadastre will be much more costly and will take much more time due to the construction of various installations and utilities. This answer has already been validated for the last four years by the accelerated activities of the Ministries and Municipalities in the marine area. As already indicated, Israeli waters include four areas: the Mediterranean Sea, the Red Sea, the Dead Sea, and the Sea of Galilee. The Sea of Galilee is a lake within Israel. 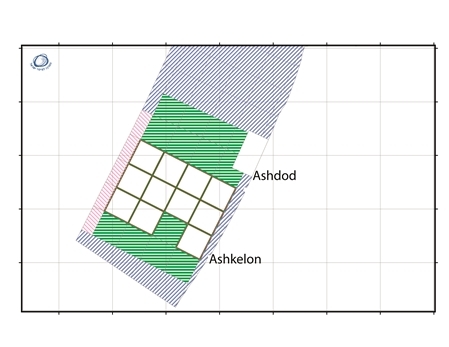 It already went through a regular land settlement process, and was divided into 4 blocks as seen in figure 3. This lake is considered as a land area and is not covered by The Convention. Furthermore, due to the temporary lowering of the water level of the lake, its outer strip has already partially dried, and each of the four blocks consists today of both a water and land area. The northern part of the Dead Sea is divided by an international boundary following the October 26, 1994 Treaty of Peace between Israel and Jordan (Israel-Jordan Peace Treaty, 1994). The historical southern part of the Dead Sea, has contracted and dried and is practically a basin used for salt pans on each side of the international boundary between Israel and Jordan (see figure 4). Figures 3 and 5* make use of data from the National Bathymetry Project. The Israeli Salt Pans' area is considered and dealt with to-day as a land area. The Israeli waters of the Dead Sea are actually internal waters. The land settlement in this area is dealt with like a land settlement over the land area. The limits of the block plans in this area, which are currently undergoing a land settlement process up to the international boundary, are defined by coordinates, so it can be considered as a practical (and not yet a legal) coordinate- based cadastre. The Israeli waters in the Gulf of Eilat - which is a branch of the Red Sea also called the Gulf of Aqaba - are considered a territorial sea. They lie between the coastline and the maritime boundary between Israel and Jordan, which was concluded in 1996 following the 1994 Treaty of Peace (Israeli-Jordanian Maritime Boundary Agreement, 1996). The southern limit of this area has not yet been defined because Israel and Egypt have not yet agreed on a maritime boundary in this gulf, but following Article 15 of The Convention it should be delimited along the equidistance line going from the terminus of the land boundary at Taba (Srebro, 2009) up to the median line along the Gulf of Eilat. 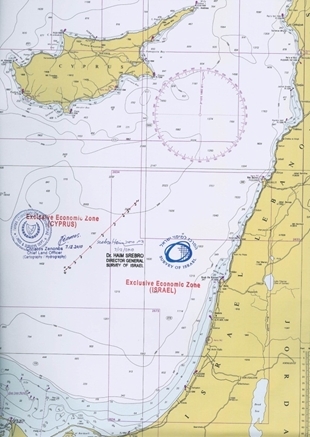 Since all the Israeli waters in the Red Sea are considered territorial sea under Israeli sovereignty, a marine cadastre in this area is applicable. Actually, most of the area has already been settled as an extension of the land cadastre (see figure 5). The basic definition of a marine cadastre includes the delimitation of the cadastral blocks. Since the delimitation refers mainly to coordinates on the water surface, the number of physical features that are included in the block plans will be very limited, if any. But, since the relevance of the cadastral delimitation, beyond the cases of special installations and potential artificial islands, is to the multilayered marine space, including the seabed and the subsoil, a proper mapping of the seabed, including physical features in the relevant area, is an important contribution to the cadastral division and to its application. At present, most of the blocks will have no such information. The blocks that will include some features will be the first line of blocks that are near the coast and a few blocks where gas or oil drilling sites plus transportation pipes or infrastructure cables that may exist as well as fish growing sea farms. Two other relevant activities are carried out during the last years by SOI. One is the production of a series of hydrographic charts. SOI has prepared 10 hydrographic charts covering the Israeli Territorial Sea in the Mediterranean Sea. This includes one 1:250,000 chart, three 1:100,000 charts and seven large scale charts, in the framework of cooperation with the Ministry of Transportation for the purpose of safety of navigation. These charts contain a lot of data in the marine area that can support a marine cadastre. The source data are collected by the Survey of Israel, the Geological Survey of Israel, and the Israel Oceanographic & Limnological Institute. An additional hydrographic chart is being prepared for the Gulf of Eilat. Another activity refers to the National Bathymetric Project, which is run by a few agencies including the Geological Survey of Israel, the Israel Oceanographic & Limnological Institute, the Survey of Israel and others. As analyzed by Ng'ang'a et al. 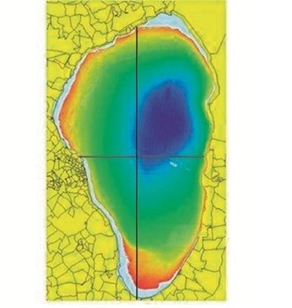 (2003), bathymetry may play a significant role in marine cadastre. This refers to the wide scope of marine cadastre, including the safety of navigation, laying communication cables, exploring and drilling for offshore oil and gas, the location of underwater mineral deposits, and gaining an understanding of the geological processes. It has a potential that has not yet been implemented, which can be used in combination with other geographic information to support marine boundary delimitation and property rights. 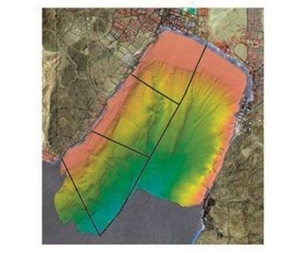 Bathymetry mapping is presented in this article in figures 3 to 5. In addition, when the use of mineral resources on the seabed and in the subsoil develops, or when construction of special marine projects, like artificial islands, develops, the need for implementing 3D or a multi-dimensional cadastre will increase. This requires the implementation of a CBC in the marine areas. Therefore, taking into account the present supporting technologies and infrastructure at SOI, the definition of the Israeli marine cadastre should be based on coordinates. This meets one of the present main initiatives at SOI, namely, to transfer to a CBC. In addition, SOI has been promoting for a few years an initiative of a 3D cadastre (Shoshany et al, 2004). This should be integrated, when applied, into the marine cadastre wherever required. The implementation of a CBC requires that all the boundaries of a block be defined by coordinates (Srebro, 2010). A full definition of blocks by coordinates in the sea is quite simple except for the case near the limits of the marine areas of a state. This limitation refers to the boundary between the marine area and the coastal area, in case that such a boundary is not defined by dominating coordinates but rather, by legal graphical documents. It also refers to the delimitation of the territorial sea of a State and an adjacent State (usually an equidistance line) and to the case of delimitation of the territorial sea between a State and an opposite State (usually a median line). The cases of the Israeli marine areas in the Kinneret, the Dead Sea, and the Red Sea have been described earlier and it was concluded that the limits of the block plans in these areas should be transformed from legal graphical documents to legal coordinates. However, the case of the marine area along the coastline of the Mediterranean Sea is more complicated. The length of the coastline is around 200km, along which exist 291 land settled block plans (see figure 6). The borders of 60 of these blocks have already been defined by coordinates (Klebanov and Forrai, 2010). The Israeli TS in this area extends to a distance of 12 NM from the base lines along the coastline. The EEZ of Israel in the Mediterranean Sea cannot cover 200NM from the coast, because the distances between the coasts of Israel and Cyprus, which are opposite coasts, are between 120NM and 200NM. Under customary international maritime law, the median line between Israel and Cyprus, which is the outer limit of the Israeli EEZ, is half way between the coastlines. As seen in figure 2, the Israeli CS is included in the EEZ. In order to define a marine cadastre, the TS should be sub-divided into block plans. The area close to the coastline should be dealt with differently than the area that is more distant, because most of the physical features and development in the marine area are close to the coast. This refers to constructions like ports, marinas, breakwaters, and pipelines. This area is also protected by the law that protects coastal environments (Srebro, 2008). As a result, it was decided to limit the size of the adjacent blocks, whereas the more distant ones were designed roughly to a size of 5x5km (see figure 7a) following the preliminary guidelines of the land settlement officer. An optional plan takes into account the limits of existing permits of exploration areas (see figure 7b). With reference to the delimitation of the blocks by coordinates, there is a basic requirement to define the land block plans along the coast by official coordinates. In order to achieve this, a pilot project of CBC was launched in 2006. This project included four areas of 15 block plans each, spread along the coast in four typical environments: one in a dense urban location, one in a semi-urban location, one in an agricultural location and one in an open area. The results, which were published in 2008, were 60 coordinate-based blocks, the coordinates of 50 of which were distributed to surveyors for optional use. The legal cadastre in Israel still does not adopt coordinates for registration (Klebanov and Forrai, 2010). This enables defining coordinate-based marine cadastre blocks neighboring the land coordinate-based block plans, but these are only part of the 291 blocks along the coast line. In order to overcome this problem, the DG of SOI decided to adopt a reference line connecting base points on the coast by straight lines, to serve as a reference line for the marine cadastre. The base points were surveyed by GPS and defined by coordinates to serve as a digital border line between the blocks adjacent to the coast and the "pure" marine blocks. In addition, since the maritime boundaries between Israel and Lebanon in the north and between Israel and Gaza Strip in the south are not yet mutually agreed upon, the marine cadastre is planned in these areas until and including the penultimate blocks, leaving the border blocks to be settled following future political settlement of the delimitation of the neighboring territorial sea areas. In addition, the DG of SOI decided to prepare for settlement the marine blocks east of the reference line landwards, which are opposite the land coordinate-based blocks, the coordinates of which were determined in the CBC pilot project. An example of such blocks is given in figure 8. The area between the coastline and the straight reference lines holds 22 settled blocks which had already been settled due to existing land development along the coast. The marine cadastre blocks, which refer to this limited area, contain 63 blocks that are in a planning process, and will be presented graphically in a 1:20,000 scale or larger for registration. 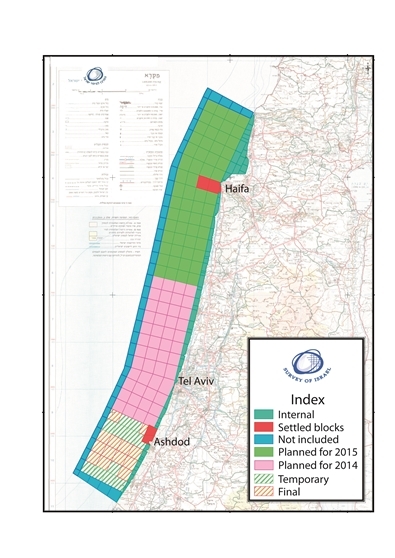 The estimated number of blocks that are included in the planned marine cadastre between the above-mentioned straight reference lines and the outer limit of the Israeli TS is 175 blocks. Most of these blocks, except the outer limits, cover as previously indicated 5x5 km (see figure 7a). The blocks can be graphically represented in a scale of 1:20,000. On the 17th of December 2010 Israel and Cyprus signed an agreement regarding the maritime delimitation line of the EEZ between the two States. The agreement was ratified in February 2011 and deposited with the UN. This was an important step regarding the delimitation of Israeli rights in the Mediterranean Sea. This agreement fully coincides with the EEZ delimitation agreements between Cyprus and Egypt (2003) and between Cyprus and Lebanon (2007). The agreement left a level of flexibility for defining final common tri-points between the relevant states at the edges of the delimited line. Following this agreement, one can see that the marine area in which Israel has exclusive economic rights is in the magnitude of the Israeli land area. As mentioned earlier, the DG of SOI and the Director of the Land Registry, agreed to promote a land settlement in the marine area. They agreed to begin with a pilot project of a marine cadastre in the TS of Israel, where Israeli law is fully applicable, and at a second stage, explore the legal feasibility of initiating settlement proceedings in the EEZ. In the EEZ Israel has limited rights according to customary international law, among them the rights to exploit natural resources, including gas and oil. The project included three marine cadastre blocks. Public declaration by a land settlement officer regarding land settlement in specified areas, announcing that potential claimers may submit claims for ownership and for rights of use in these areas. Legal appeals to a District Court (optional). The technical and practical solution used by SOI for the implementation was a result of the special circumstances associated with the marine cadastre, where demarcation is not relevant and the delimitation of boundaries is actually the process of defining coordinates. In order to minimize the problems of the external limit of the relevant marine area seawards to be settled at this stage, this line was defined as a line 12 nm from the base line along the coast, actually the outer limit of the territorial sea. In order to have a proper limit defined by coordinates, the chosen pilot area was one of the places on land that underwent a process of transformation to coordinates in the CBC pilot project (Srebro, 2010). These decisions limited the problems because the marine blocks should be defined between polygons that are well defined by coordinates. The area that was chosen for a pilot project is an area south of the city of Haifa. The relevant coastal land blocks along this area that were transformed to CBC in 2006 are shown in Figure 8. The traditional legal cadastral registration is still based on graphical documentation. One should consider that the landwards limit of the blocks along the coast line, which is the cadastral reference in this area, does not coincide with the coast line existing in the National GIS, as depicted from aerial photographs. However, it does not coincide with the coast line defined by the DG to support the law for the protection of the coastal environment (Srebro, 2008), which is defined at a level of 0.75 m from the zero of leveling. It also does not coincide with the exact low water line, which changes with time, or with the straight base line in this area. In addition, the existing administrative municipal line in the area does not coincide with the cadastral reference (see figure 10). The cadastral external line along the coast is a polygon connecting the external (western) limits of the coastal land blocks. The result of the decision to use the straight base lines along the coast as boundaries of marine blocks created the first series of marine blocks covering the internal waters between the outer limit of the land blocks and the line connecting the coastal base points (the Reference Line in figure 10). The preference for the lateral limits of the first marine blocks was to refer to existing municipal boundaries, but the municipal limits are currently undergoing re-definition. The size of the regular marine blocks between the reference line connecting the coastal base points and the outer limits of the territorial sea was defined roughly by 5x5 km cells following the preference of the land settlement officer (Figure 11). The first legal step of the land settlement officer of the District of Haifa was to declare publicly his intention to settle the specific area in the near future. This declaration is under article 9 of the Land Title Settlement Law. This declaration, which is published in Reshumot (the official gazette of the Government), in newspapers and on the internet, provides notices to people or organizations that have claims regarding the area specified in the declaration; they can submit their claims within the period specified in the public announcement (two months). This declaration was published on July 12, 2011. During the specified period, the land settlement officer has to announce a formal visit to the area, to serve as an opportunity to show all potential claimers the area of settlement and to give a chance to any claimer to show the physical limits of his claim. This procedure, which is a standard procedure in land settlement, was also used for the settlement of the marine blocks. But since visual physical features in the sea are rare, unlike the situation on land, an alternative was found by organizing a sailing expedition to inspect the marine blocks that were nominated in the published declaration. Under another regulation, the formal visit to the area should be publicly announced (in the printed and electronic media) 14 days in advance. This was done and the sailing expedition to the area took place on September 8, 2011. As an expression of the "historical" moment in implementing a marine cadastre in Israel, both the DG of SOI and the Director of Land Registry and part of the relevant staff were on board the ship. There were no private claimers who joined the expedition, but the leading claimer attended it. He was a senior representative of the Israeli National Land Authority, which is responsible for the management of all State owned lands. This reflected the fact that the Government of the State of Israel claims ownership over the area under Art.108 of the 1969 Land Law. The trip took half a day following mainly the limits of the blocks, but no physical evidences were found except a few buoys. The sea bed was also explored by sonar and no unusual findings were registered there either. Following this formal visit to the area, the land settlement officer made decisions regarding the limits of ownership and right of use in the relevant blocks (specific strip parcels were assigned for a communication cable in the area). SOI prepared final block plans following the instructions of the land settlement officer. These block plans were signed officially, as required by law, by the DG of SOI. Then the land settlement officer published his decisions about the assignment of ownership and rights of use within these blocks and the blocks were registered at the beginning of October 2011. Following the successful pilot project, SOI and the Land Registry continue their cooperation regarding the settlement of marine blocks. At the end of summer 2014: 16 marine blocks were fully registered and an additional 13 marine blocks are close to their final approval before registration. An additional 106 marine blocks are included in a bi-annual plan to begin the land settlement process, not including the marginal blocks along the limits of the territorial sea zone. 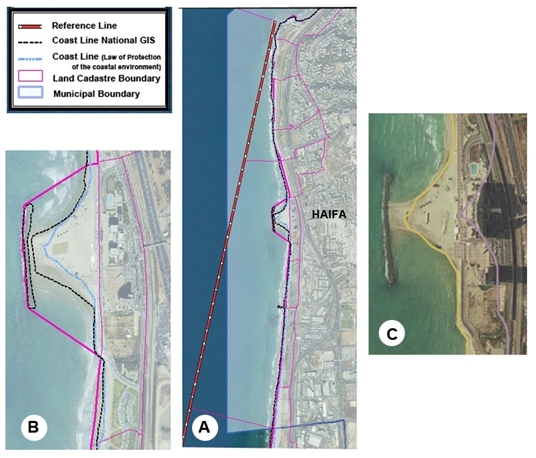 Following this process but with no direct connection, the DG of the Ministry of Interior – the Ministry responsible for defining municipal boundaries in Israel - nominated a committee to define the boundaries in the sea of the municipal authorities along the coast line. This step reflects the growing importance of the marine areas along the coast line in general and especially for the cities and towns spread along the coast line. It can propel and accelerate the process of land settlement in the sea along the coast expanding the marine cadastre. Defining the new municipal boundaries will influence the internal boundaries within the first line of marine blocks. When the author appeared in front of the committee, he recommended that municipal limits be defined in full coordination with the limits of the cadastral block plans. This will also require a change in the front series of land blocks in order to adjust the limits of the blocks to the new external municipal line either by enlarging existing blocks or by adding new blocks. In addition to this activity, a special committee is expected to be formed to consolidate inter- ministerial activities, initiating a policy document regarding the marine areas of Israel. The intention of the author of this article is that this committee will also promote collection and integration of data and knowledge, to become the basis of a marine geospatial data base in which the marine cadastre will be one of the layers, and thus create a Marine Geospatial Data Infrastructure as part of the Israeli Spatial Data Infrastructure (ISDI). The marine geospatial data base will be connected to the land geospatial infrastructure to form a land-marine geospatial data base. As part of this effort, SOI is in the process of converting the hydrographic data included in its series of hydrographic charts to GIS. One of the major challenges in this process is the different data standards that are used for land and marine geo-information. The author has adopted the definition of a marine cadastre regarding the definition of cadastral borders and not the wide scope of marine information (a multipurpose marine cadastre). There is a definite requirement for both, but the issue regarding the development of a marine spatial data infrastructure should and will be dealt with separately. The rapid land development and exploitation of lands along the coasts contribute to the trend of development of the marine areas. The Israeli sovereign rights in the marine area should be geo-referenced and referred to a cadastral infrastructure, as early as possible, in order to obtain more benefits at lower cost as long as there are no conflicting claims. 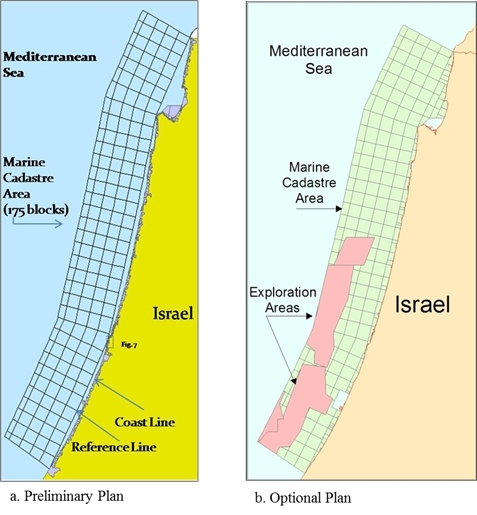 The strong requirement to utilize the marine areas of Israel and the need to prepare the infrastructure for management of rights in this area resulted in an initiative to implement an Israeli Marine Cadastre regarding the definition of cadastral borders (Srebro et al., 2010) and to prepare a plan for such an implementation. Following this initiative and the following implementation plan, there was a significant advancement. The Survey of Israel and the Land Registry have already finished in October 2011 the process of settling 16 marine cadastral blocks and an additional 13 blocks await final approval. The process of implementation was smooth, fast, and at a low cost. Israel signed a maritime delimitation agreement in the EEZ with Cyprus; new large gas fields were discovered, requiring the construction of a conduction and distribution network including coastal terminals; an effort to delimit the municipal boundaries in the sea was launched, coastal environment protection regulations and measures have been implemented; and activities involving integrating governmental data into the marine area as well as building a Marine Spatial Data Infrastructure have been considered and practical measures have been taken. These activities show the importance of fast implementation of a marine cadastre as long as the cost remains low. The marine cadastre will contribute to improve planning and coordination and can optimize investments. The author thanks Advocate Alisa Caine the Director of the Israeli Land Registry at the Ministry of Justice and Mr. Haim Laredo the Land Settlement Officer of the District of Haifa. The author thanks the people of the Survey of Israel (SOI) for their help with the data and most of the figures: Mr. Ronen Regev, the Director General; Mr. Itzhak Fabrikant, Deputy Director for Cadastre; Mrs. Orit Marom head of the cadastral department; Dr. Yaron Felus, Chief Scientist; and Mrs. Eti Benin, Mr. Baruch Peretzman, Mr. Elias Koifman, Mr. Hagi Ronen, Mrs. Limor Gur-Arie, Mrs. Lea Ezra and Mrs. Rachel Saranga. The author thanks Mr. Ronie Sade for his support with the figures based on the data of the National Bathymetry Project and Spot data. Note: The basic version of this article was written in 2012 when the author still served as the DG of SOI. Agreement on the Delimitation of the Exclusive Economic Zone between Israel and Cyprus (2010), signed in Nicosia on 17 December 2010. Binns A., Rajabifard A., Collier P.A. and Williamson I., (2003), Issues in Defining the Concept of a Marine Cadastre for Australia, UNB-FIG Meeting on Marine Cadastre Issues, New Brunswick, Canada, 15-16 September 2003. Binns A., (2005), Defining a Marine Cadastre – Legal & Institutional Aspects, Marine Administration Workshop Understanding the Spatial Dimension, Sydney, Australia, 1 December 2005. Fulmer J., (2007), The Multipurpose Cadastre Web Map. Presented at 2007 ESRI Survey & Engineering GIS Summit, San Diego, California, June 16-19, 2007. Byrne T., J.E. Hughes-Clarke, S.E. Nichols and M.I. Buzeta, (2002), The Delineation of the Seaward Limits of a Coastal Marine Protected Area Using Non-Terrestrial Subsurface Boundaries – The Musquash Estuary MPA. Published in the Proceedings of the Hydrographic Conference, Toronto, Canada, May 2002.
International Hydrographic Organization, (2011), Spatial Data Infrastructures "The Marine Dimension", Guidance for Hydrographic Offices, C-17 Edition 1.1.0., February 2011,IHB, Monaco. Israel-Jordan Peace Treaty (1994), Peace Treaty between the State of Israel and the Hashemite Kingdom of Jordan, 26 October 1994, UNTS 35325 Volume 2402. Israel-Jordan Maritime Boundary (1996), The Maritime Boundary between the State of Israel and the Hashemite Kingdom of Jordan, 18 January 1996, UNTS 35333 Volume 2403. Klebanov M. and Forrai J., (2010), Implementation of Coordinate Based Cadastre in Israel: Experience and Perspectives. Proceedings of XXIV FIG Congress, Sydney, Australia. Ng'ang'a S., Nichols S. and Monahan D., (2003), The Role of Bathymetry Data in a Marine Cadastre: Lessons from Proposed Marine Protected Area. US Hydrographic Conference, Biloxi, Mississippi, 24-27 March 2003. Ng'ang'a S., Nichols S., Sutherland M. and Cockburn S., (2001), Toward a Multidimensional Marine Cadastre in support of good Ocean Governance, New Spatial Information Management Tools and Heir Role in Natural Resource Management, International Conference on Spatial Information for Sustainable Development, Nairobi Kenia, 2-5 October 2001. Nichols S., Monahan D. and Sutherland M., (2000), Good Governance of Canada's Offshore and Cadastral zone: Towards an Understanding of the Marine Boundary Issues. Geomatica, 54 (4) 415-424. Nichols S., Ng'ang'a S., Cockburn S. and Sutherland M., (2003), Marine Cadastre: The basis for understanding the use and governance of marine spaces. Presented on behalf of the Association of Canada Land Surveyors to the Parliamentary Committee on Oceans, Canada, 17 February 2003. Robertson B., Benwell G. and Hoogsteden C., (1999), The Marine Resource: Administration Infrastructure Requirements, UN-FIG Conference on Land Tenure and Cadastral Infrastructure for Sustainable Development, Melbourne, Australia. Shoshani U., Benhamo M., Goshen E., Denekamp S. and Bar R., (2004), Registration of Cadastral Spatial Rights in Israel – A Research and Development Project, FIG Working Week Athens Greece, May 2004. Srebro H., (2008), Definition of the Israeli Coastline, FIG Working Week 2008, Stockholm, Sweden, 14-19 June 2008. Srebro H., (2009), The Definition of the Israeli International Boundaries in the Vicinity of Eilat, FIG Working Week 2008, Eilat, Israel, 3-8 May 2009. Srebro H., (2010), On The Way to a Coordinate Based Cadastre (CBC) in Israel, FIG International Congress, Sydney, Australia, 11-16 April 2010. Srebro H., Fabrikant I. and Marom O., (2010), Towards a Marine Cadastre in Israel, FIG International Congress, Sydney, Australia, 11-16 April 2010. Sutherland M., (2003), Report on the outcomes of The UNB-FIG Meeting on Marine Cadastre Issues Held at The Wu Centre, University of New Brunswick Fredricton, New Brunswick, Canada 15-16 September 2003. Sutherland M., (2009), Developing a Prototype Marine Cadastre. 7th FIG Regional Conference, Hanoi, Vietnam, 19-22 October 2009. United Nations, (1983), The Law of the Sea, Official Text of the United Nations Convention on The Law of the Sea with Annexes and Index. United Nations Publication, Sales No. E.83.V.5, New York, 1983. Dr. Haim SREBRO received his BSc and MSc degrees from the Technion, Haifa, in Civil Engineering and Geodetic Engineering and his PhD from Bar-Ilan University. He was a teacher at the Technion and at Tel-Aviv University. He served during the years 2003-2012 as the Director General of the Survey of Israel and as Chair of the Inter Ministerial Committee for GIS. He is a Co-Chairman of the Israeli-Jordanian Joint Team of Experts since 1994, responsible for the delimitation, demarcation, documentation and maintenance of the International Boundary within the Joint Boundary Commission. Since 1974 he is a leading figure in the boundary negotiations and demarcations between Israel and its neighbors and signed the 1994 Peace Treaty between Israel and Jordan and the 1996 Maritime Boundary Delimitation. In 2010 he signed the Israel-Cyprus Agreement on the EEZ Delimitation. He was a member of ASPRS since 1978 and a member of ACSM and is a member of the Israeli Society of Photogrammetry and Remote Sensing, the Israeli association of Cartography and GIS, and of the Israeli Chambre of Licensed Surveyors. Dr. Srebro was the Conference Director of FIG Working Week 2009 at Eilat. He chairs the WG on International Boundaries of FIG Commissions 1. He was the editor-in-chief of The New Atlas of Israel in Hebrew (2008) and English (2011), and of the Atlases of the Israeli coast lines in the Mediterranean Sea (2005) and in the Red Sea and in the Kinneret (2011). He is co-author of the book 60 Years of Surveying and Mapping Israel (2009), author of the book The Boundaries of Israel Today (2012), Editor and co-author of FIG Publication No 59 on International Boundary Making (2013), and author of a few books in Hebrew.